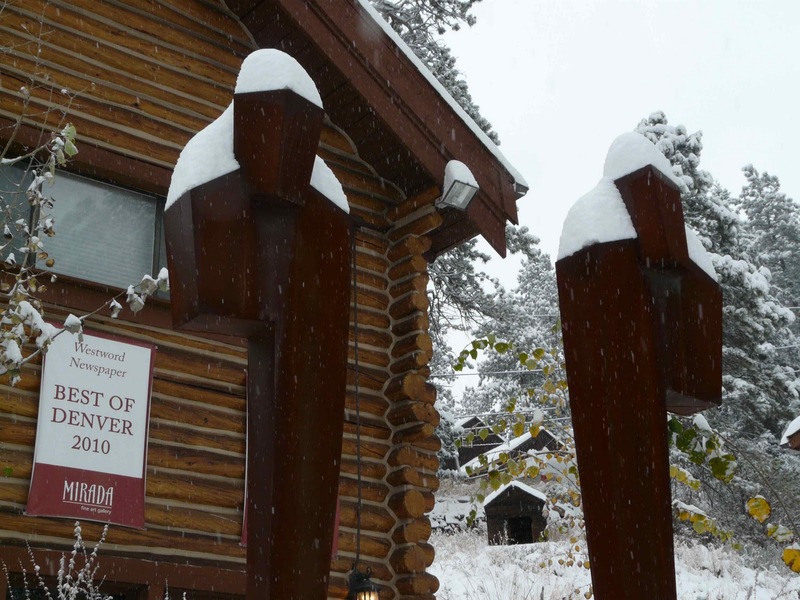 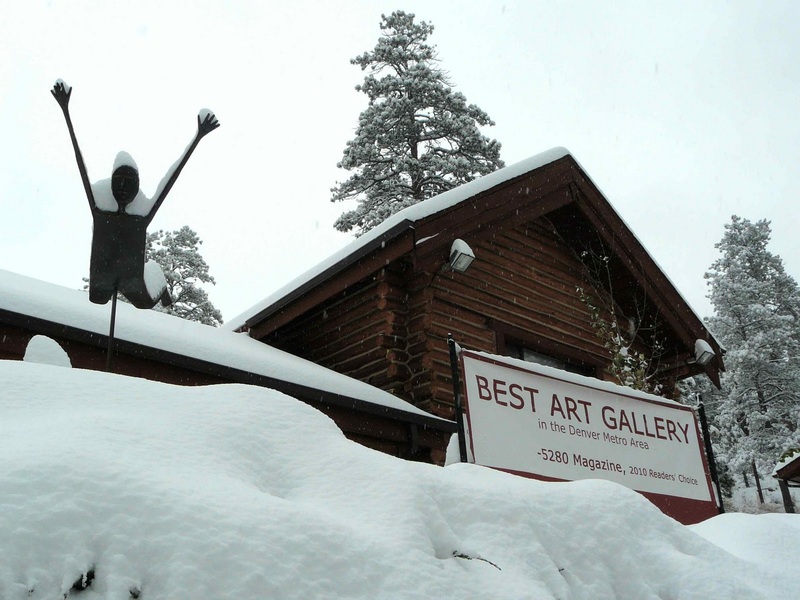 Last night, we had the first significant snow of the season and it's beautiful here at Mirada Fine Art! 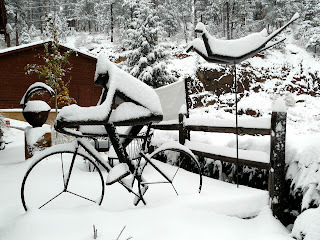 Here are a few photos of the scene here today. 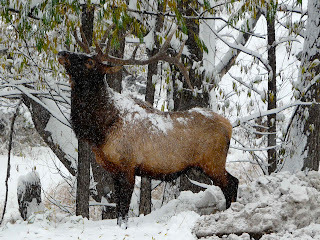 As you can see, one of our large neighbors was just munching away on a tree about 20 feet from the gallery as we dug ourselves out of the snow. 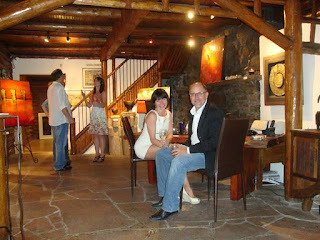 He seemed particularly fond of Allen Wynn's sculptures. Mirada Fine Art's neighbor hangs out about 20 feet from the gallery while we shovel. 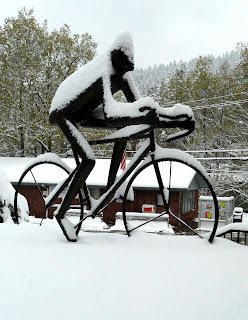 Allen Wynn's 'Cyclist' won't be slowed by a little snow. John Ferguson's 'Rejection' is even more dramatic in the snow. Allen Wynn's sculptures are amazing any time...but look particularly great today in the snow. 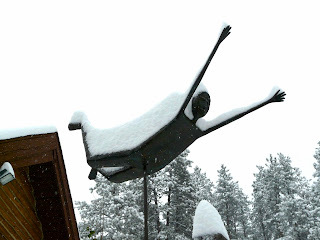 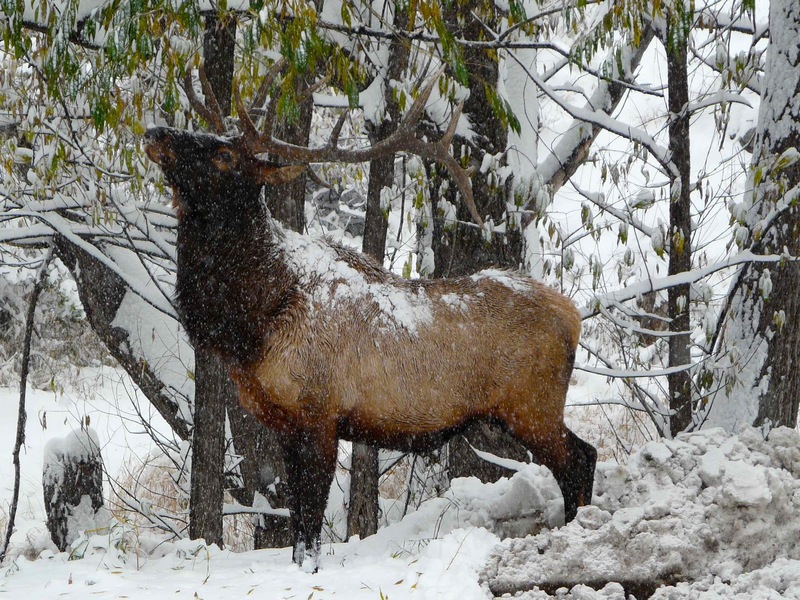 Allen Wynn's 'Flying Charlie' won't let a little snow storm slow him down. 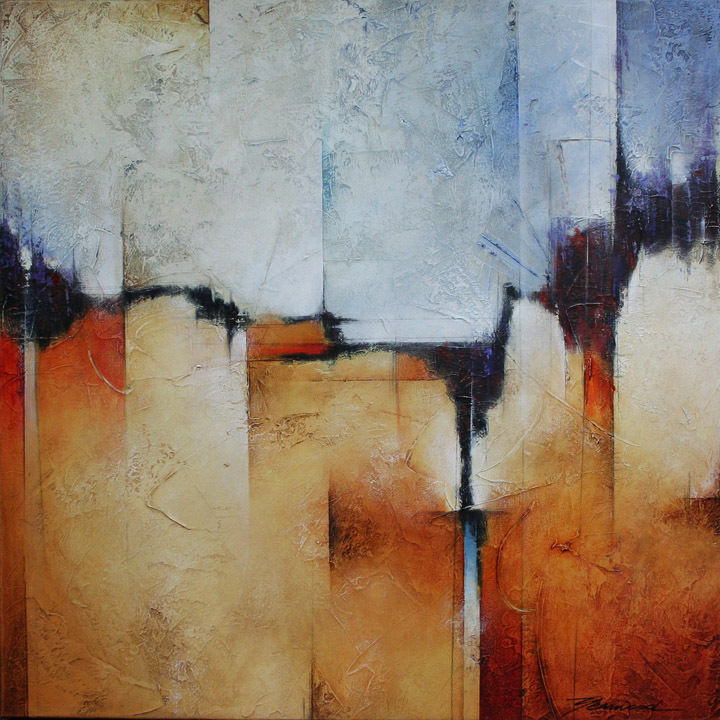 Mark Yearwood at Mirada Fine Art, Ventanas, Acrylic on Canvas, 36" x 48"
Mark Yearwood at Mirada Fine Art, Antico, Acrylic on Canvas, 30" x 30"
Mark Yearwood at Mirada Fine Art, Tierra Roja, Acrylic on Canvas, 36" x 48"
Mark Yearwood at Mirada Fine Art, Arrival, Acrylic on Canvas, 24" x 24"
Mark Yearwood at Mirada Fine Art, Cambios, Acrylic on Canvas, 20" x 30"
Mark Yearwood at Mirada Fine Art, Discovery, Acrylic on Canvas, 24" x 24"
We had a phenomenal opening reception on Friday night, October 14th of 'Geometry of the Rockies:' the new exhibition featuring the contemporary landscapes of Deladier Almeida. 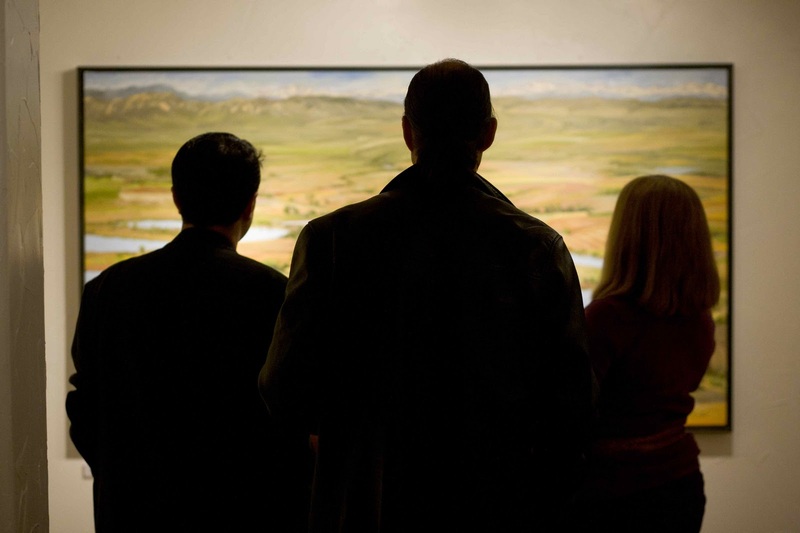 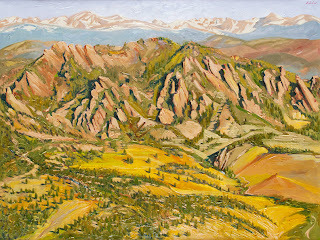 All of the paintings of this exhibition are inspired by Deladier's time flying over the Colorado Rockies and the front range in a low-flying airplane last June. 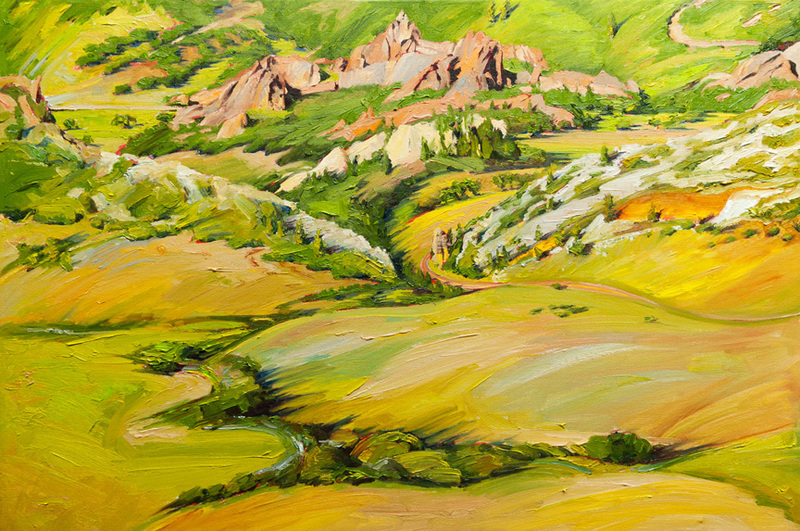 Areas such as Rocky Mountain National Park, the flatirons, and Roxborough park are highlighted in this amazing body of work. 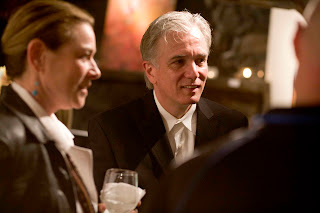 Following are some photos from the reception. 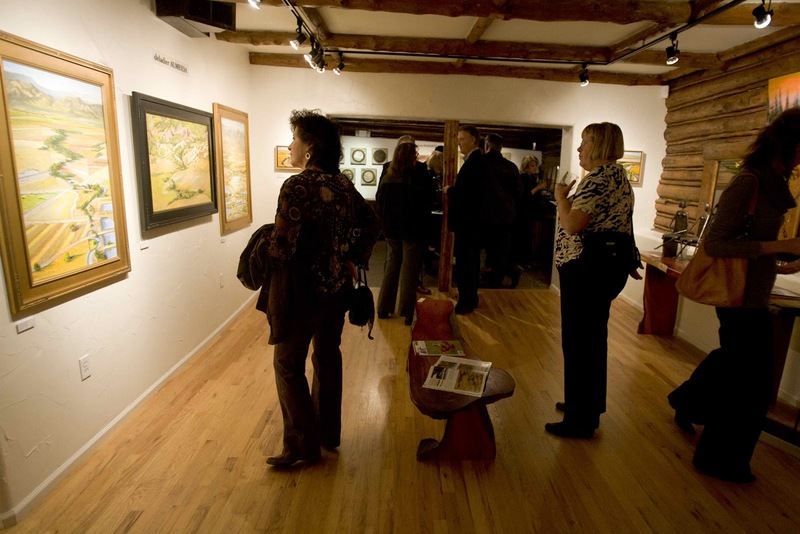 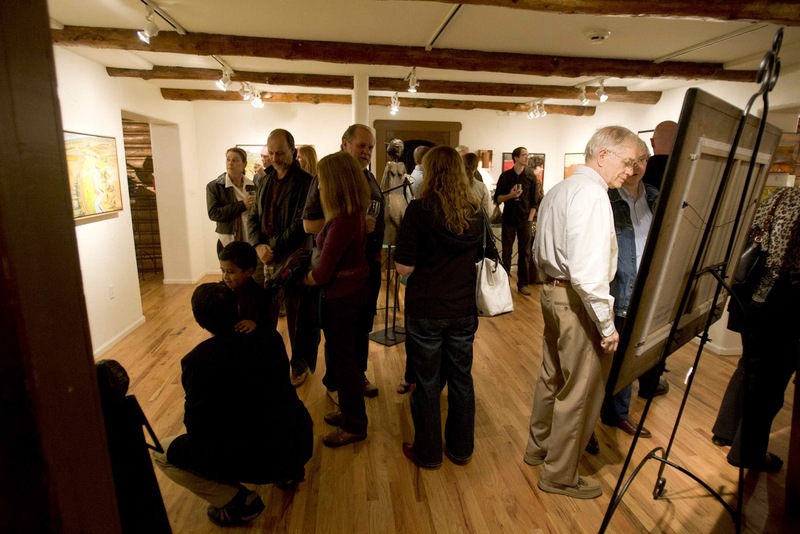 If you weren't able to attend, the exhibition will still be on display through November 6th. Deladier Almeida at Mirada Fine Art, Patrons enjoying Deladier's newest works. 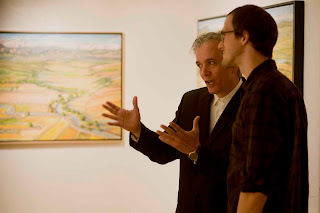 Deladier Almeida at Mirada Fine Art, Poetic Fractures, Oil on Linen, 40" x 72"
Deladier Almeida at Mirada Fine Art: Deladier explains his technique. 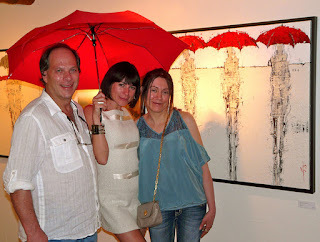 Deladier Almeida at Mirada Fine Art. 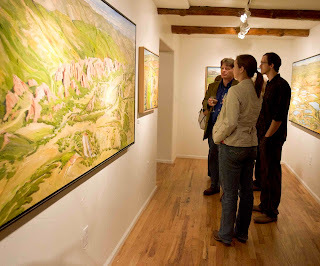 Deladier Almeida at Mirada Fine Art, 'Geometry of the Rockies' opening reception. 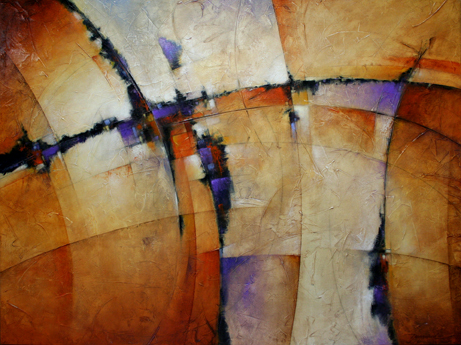 Deladier Almeida at Mirada Fine Art, Autopunctuation, Oil on Canvas, 12" x 24"
Deladier Almeida at Mirada Fine Art, Calligraphy of Gravity, Oil on Linen, 36" x 24"
As a five-year old child, Deladier Almeida was riveted when he saw a movie featuring an artist demonstrating how Leonard da Vinci might have created the Mona Lisa. 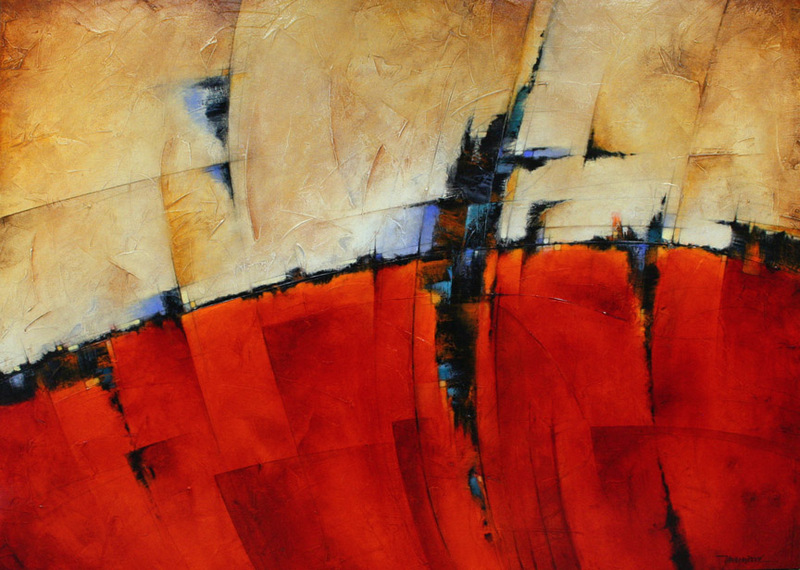 Amazed by the magic of turning a flat surface into a three-dimensional image, that child knew right then he would be an artist when he grew up. Almeida brings that magic to Colorado when his exhibition, ‘Geometry of the Rockies,’ opens at Mirada Fine Art Gallery in Indian Hills. 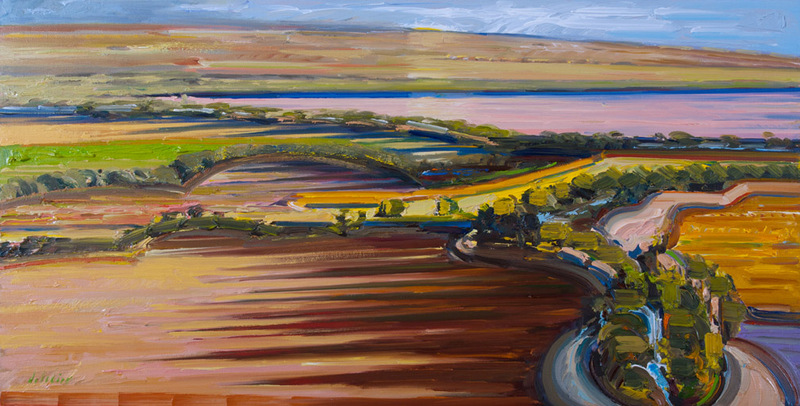 A reception for Deladier will be held on Friday, October 14 from 6-9pm, and his exhibit will be on display at the gallery from October 15 through November 6. 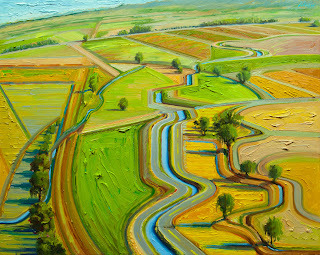 Deladier Almeida at Mirada Fine Art, Linear Eccentricities, Oil on Linen, 30" x 40"
Born in the coastal town of Santos, Brazil, as a young man Deladier Almeida studied architecture, industrial design and urban planning, and worked at a Sao Paolo newspaper creating illustrations of heads of state. 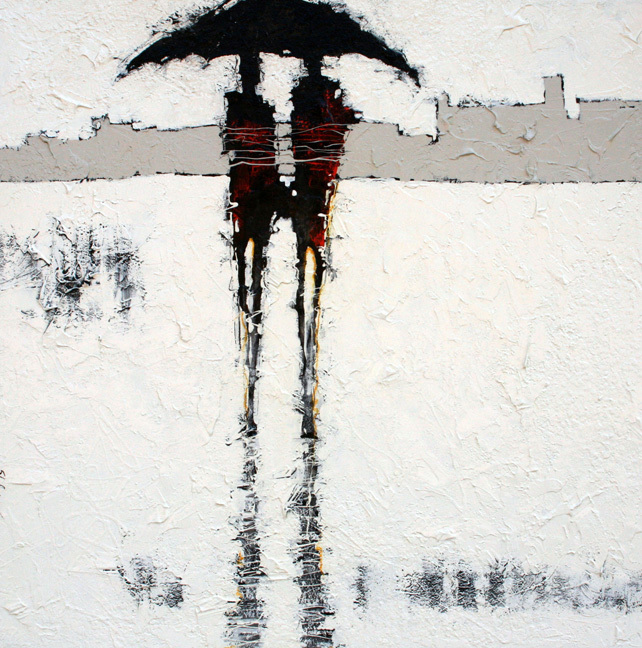 At the age of 25, he met and married a U.S. exchange student. The couple flew to America and settled down in Northern California. During the flight, Deladier’s first ever, he was stunned the other passengers were oblivious to the panoramic views outside the plane’s windows. 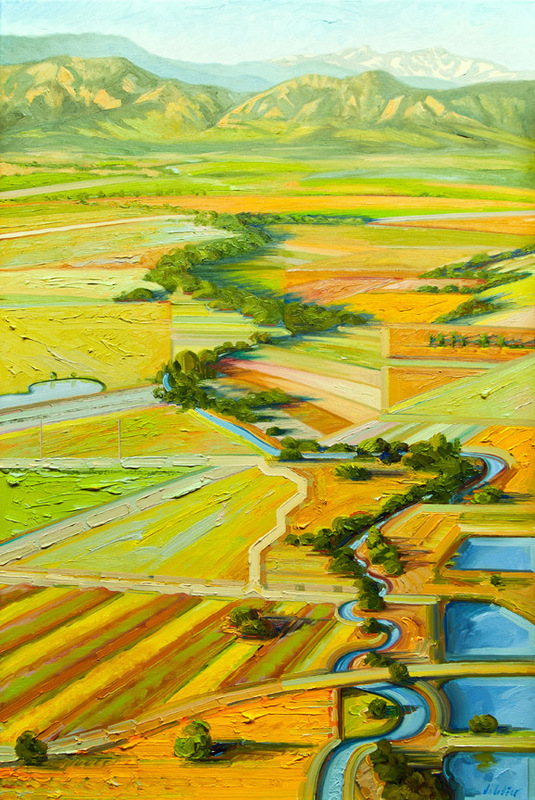 That flight made a lasting impression on him, and greatly influenced his choice to create rich oil paintings of landscapes viewed from an aerial perspective. 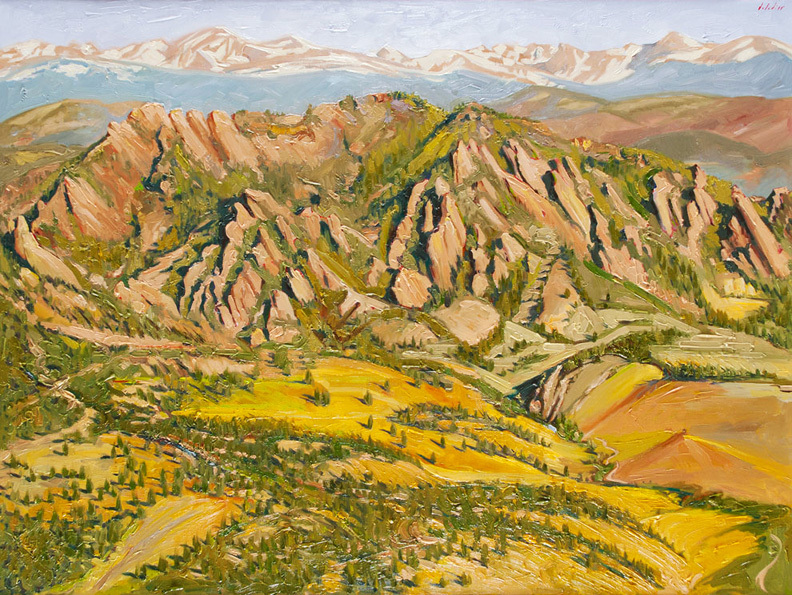 Last July, Mirada Fine Art arranged a special ‘fly-over’ of Colorado’s front range in a low-flying plane for Deladier so that he could use his remarkable skills and take on the majestic beauty of Colorado Rockies. 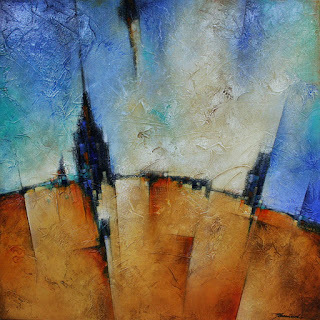 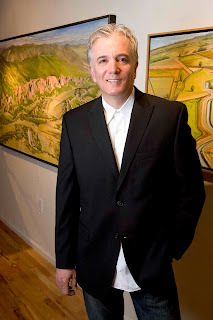 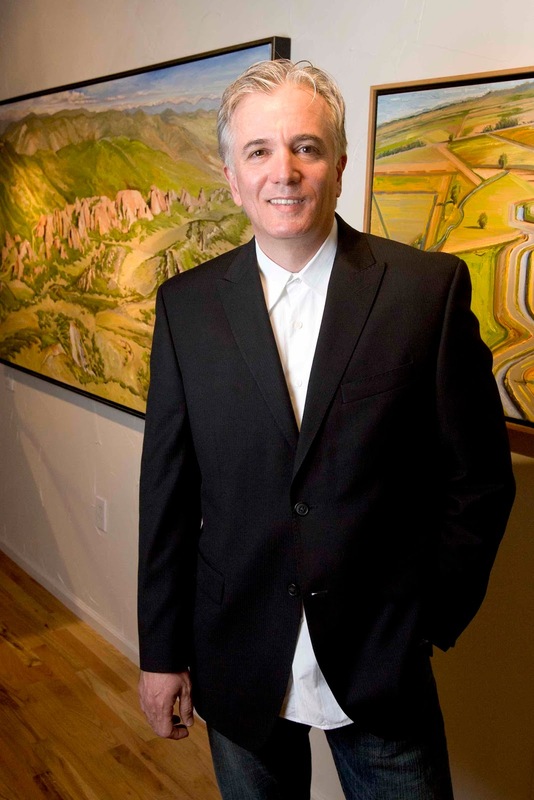 This was the impetus for his latest collection of paintings, entitled ‘Geometry of the Rockies,’ featuring rich, textural oil paintings inspired by the Flatirons, Red Rocks, Rocky Mountain National Park and other Colorado landmarks. 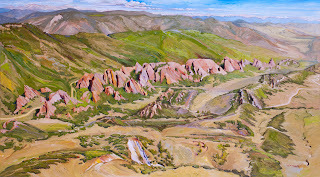 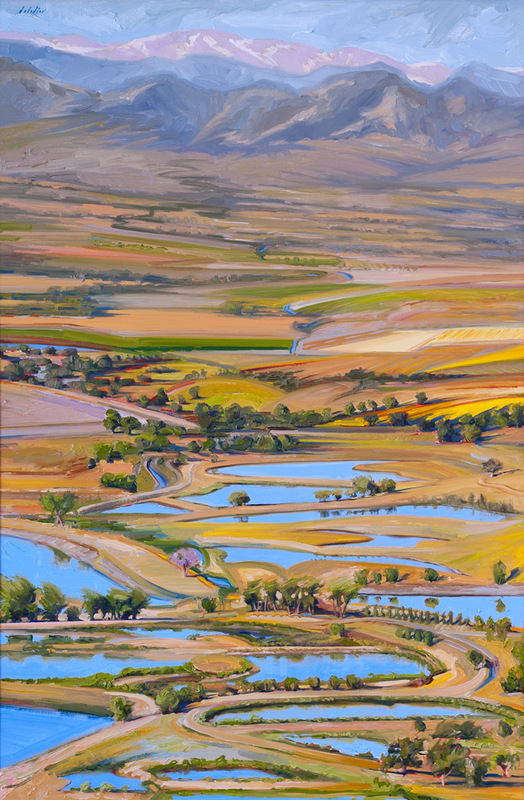 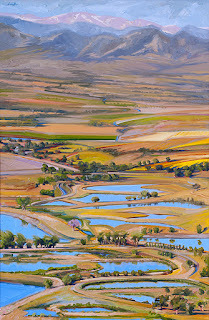 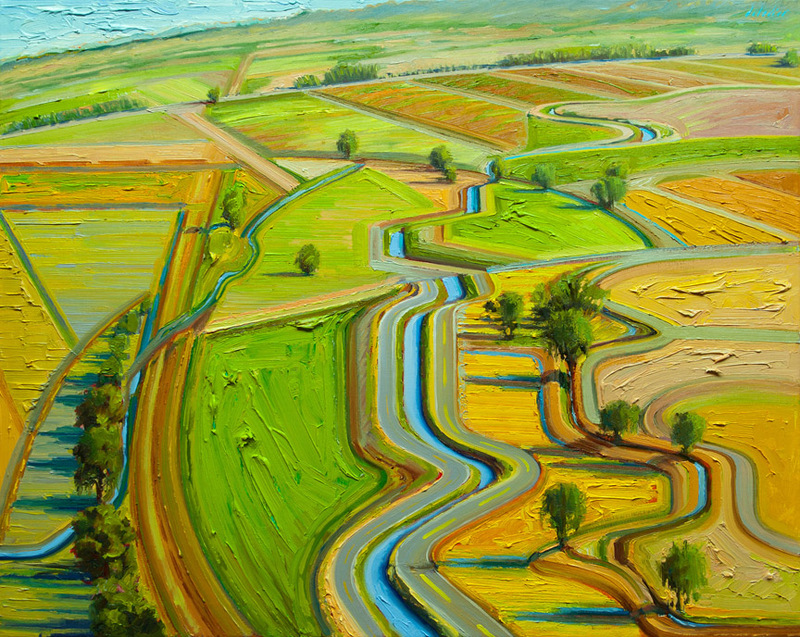 Deladier Almeida at Mirada Fine Art, Boulder Dance, Oil on Linen, 24" x 30"
“I’ve always enjoyed looking down on large landscapes, and I can’t really see the scene unless I go up above it,” explains Almeida. 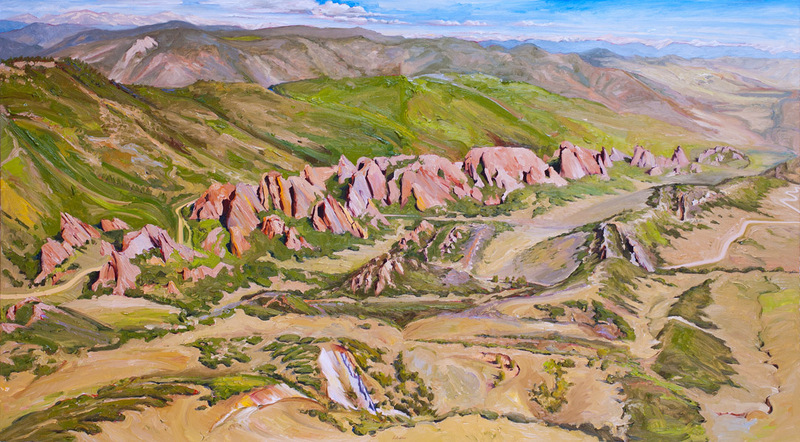 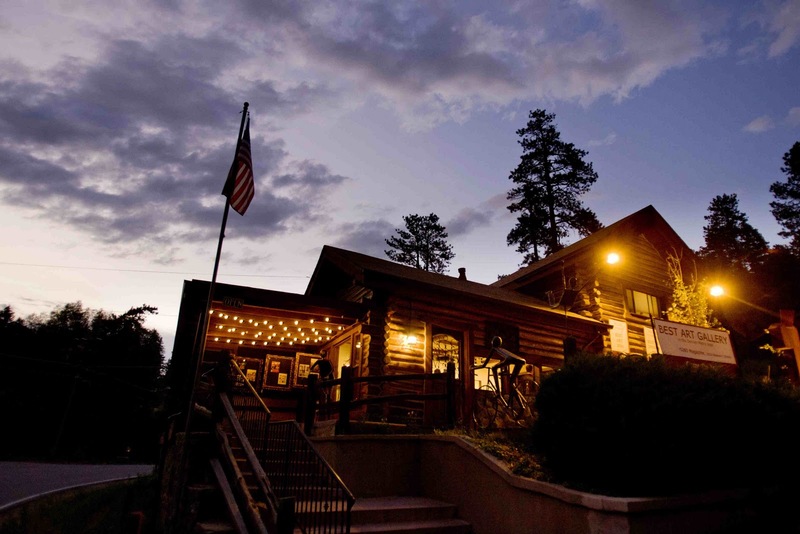 For some time, he’s wanted to do a series featuring Colorado scenes, and Mirada’s owner and curator, Steve Sonnen, offered him just that opportunity. “His work really embodies that ‘Colorado feel’ and we wanted him to have a direct connection with it,” stated Sonnen. 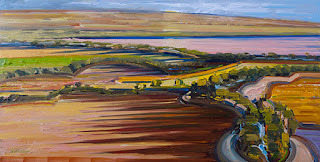 The viewer of Deladier’s paintings will be struck not only be the natural, warm color palette he employs, but also the strong geometric shapes and design, helping him depict the beauty of our region. 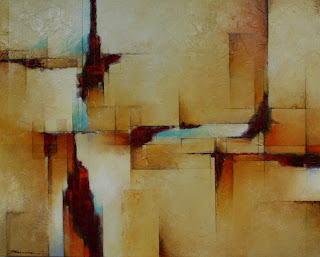 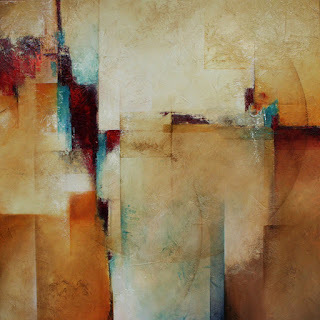 Deladier Almeida at Mirada Fine Art, Brief Modulations, Oil on Linen, 36" x 24"
Deladier’s career has been on fire over the last year: he was just on the cover of Southwest Art magazine, featured twice in American Art Collector, and named 'One to Watch' by Fine Art Connoisseur magazine. Deladier Almeida at Mirada Fine Art, Flatirons, Oil on Linen, 30" x 40"
The public is invited to meet Deladier Almeida during the opening reception at Mirada Fine Art Gallery, Friday, October 14th from 6-9pm. 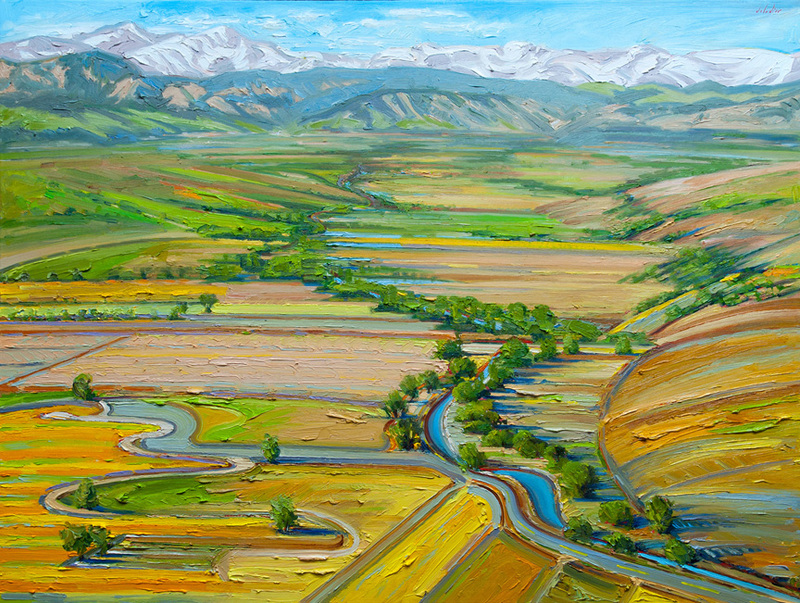 “Geometry of the Rockies” will be on exhibit through November 6th at the gallery located in Indian Hills on Parmalee Gulch Road off Hwy 285, just 5 miles west of C-470. 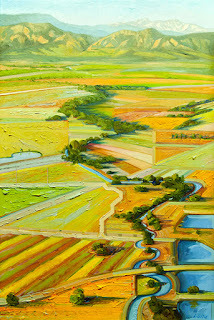 Deladier Almeida at Mirada Fine Art, Occlusions, Oil on Linen, 24" x 30"
If you didn't make it to the reception of '8354 MILES,' here are some photos of the event. 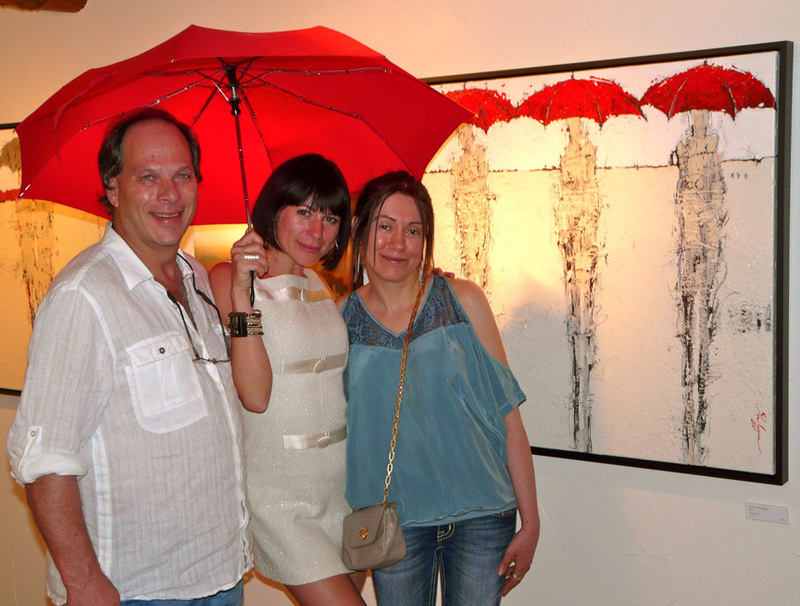 We'll have Arturo Mallmann and Svetlana Shalygina's special exhibit hanging for another week...come check it out. 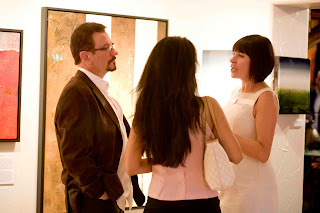 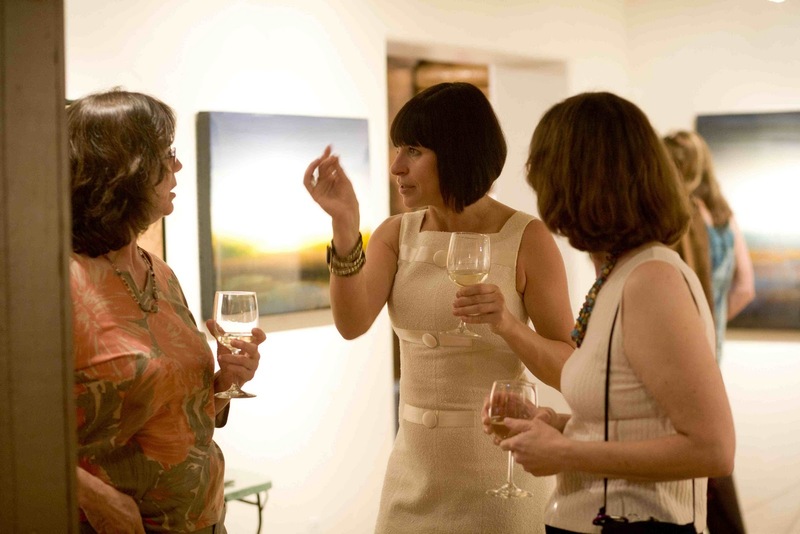 Svetlana Shalygina at Mirada Fine Art, Speaking with some admirers of her work. Svetlana Shalygina at Mirada Fine Art, discussing her technique. 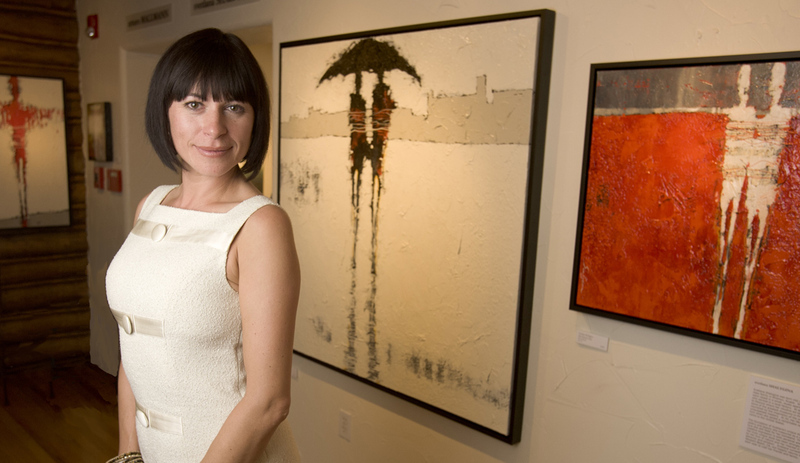 Svetlana Shalygina at Mirada Fine Art. 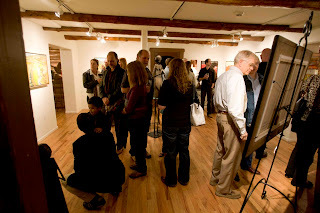 9.2.2011 Opening Reception. 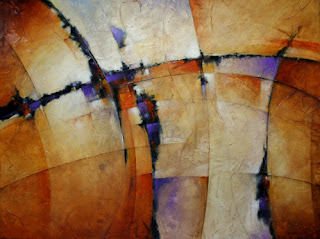 Svetlana Shalygina at Mirada Fine Art, The City, Mixed Media on Canvas, 48" x 48"